The Ansonia Gridiron Club has announced that their annual Recognition Dinner will be held on Friday, June 3 at 6 p.m. The event will be at the Adratic Marchegian Club, Hawthorne Avenue, in Derby. The Gridiron Club will honor former players Pat, Tim and Terry McNamara and also the state championship teams of 1976 and 1977. Enjoy Jersey Mikes Subs on Sundays, Help Ansonia Football! Take out an Ad in the 2015 Ansonia Football Game Program! Join the Ansonia Gridiron Club for a night out! The Coughlin Roast! The Chargers beat the Windham Whippets 35-14 to advance to their 5th Straight Championship game. The weather was awful - cold and very rainy. But that didn't stop running backs Tyler Bailey (110 rush yds., 3 TD's) and Tajik Bagley (124 rush yds). from controlling the football on the ground. The Chargers moved to 9-1 on the season, beating the Kennedy Eagles 43-8 on Senior Night at Jarvis Stadium. Tajik Bagley ran for 3 touchdowns, and ran for 259 yards, while Tyler Bailey caught 2 TD passes from Ja'Quan McKnight. Jevonne Lashley also scored for the Chargers, who led 43-0 in the 4th quarter. With the win, Ansonia has almost clinched a playoff spot in class S, just needed a few bonus points to qualify. The Chargers rallied with 2 Touchdowns in the final 2 minutes to defeat Woodland, 30-28. Both of the the touchdowns cam on 4th & goal throws from MCKnight to Tyler Bailey. The Chargers rebounded from their first loss in over 3 years by beating Holy Cross 42-6 at Nolan field. Led by RB Tajik Bagley(4 rushing TD'S) and WR Witold Gul (2 TD catches), the Chargers respnonded after trailing early 6-0., putting up 42 unanswered points. Bagley ran for 151 yards on 23 carries, and Gul caught 3 passes for 123 yards. QB Jai'Quan McKnight completed 5 of 7 passes for 176 yards in the win. Ansonia saw their 48 game winning streak come to an end, losing a hard-fought defensive battle to #5 Newtown. Ansonia trailed 7-0 at halftime, then 14-0 before Tyler Bailey hauled in a 19 yard pass from McKnight, then McKnight ran in a 2 pt conversion. The Chargers has their chance in the 4th qtr, twice driving deep into Newtown territory, but were just unable to finish. Next game is Friday at 7:00 pm vs. Holy Cross - home at Nolan Field, Come out and support your Chargers!! The usually dominant Ansonia Defense got of to a shaky start in this one, but the offense and special teams picked it up. Jai'Quan McKnight scored on a long kickoff return, and ran fro another score, while Tyler Bailey score 4 TD's, 3 on the ground and one on a 61 yard punt return. Tajik Bagley ran for 2 scores. Sorry, no photos this week. Next game: Friday at Newtown at 7:00pm. Everyone, come out and support Big Blue as they attempt to tie Cheshire's state record for most consecutive wins at 49!!! Be there!! In a battle of undefeated teams, the Chargers came out and dominated rival Seymour en route to a 43-6 win. Jr. Tailback Tajik Bagley - playing on an injured ankle, ran for 3 scores, and Sr. QB Jai'Quan McKnight ran for 2 scores, and threw for a 3rd to Witold Gul. Ansonia's defense was dominant, holding Seymour running back Joe Salemme to just 70 yards in the game. Week 3: Chargers 40, Wilby 0. Tyler Bailey led the offense, scoring 5 TD's on the day (4 rushing, and one 50 yard punt return), while Armani Rivera also scored on a long run for Ansonia. The defense was great once again, limiting WIlby to 1 first down in the entire first half. Offensively, Jr. tailback Tajik Bagely scored on a 43 yard run early, before leaving with an injury in the 2nd quarter. Tyler Bailey picked up some of the slack, scoring on runs of 9 yards and 4 yard in the 2nd half, while Sr, QB Jai'Quan McKnight scored on runs of 45 yards and 34 yards. Next game is on the road at Wilby this Friday at 3:30 PM. 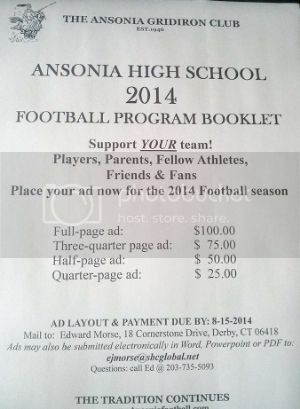 Support the 2014 Ansonia Chargers by placing an ad in the football program booklet. 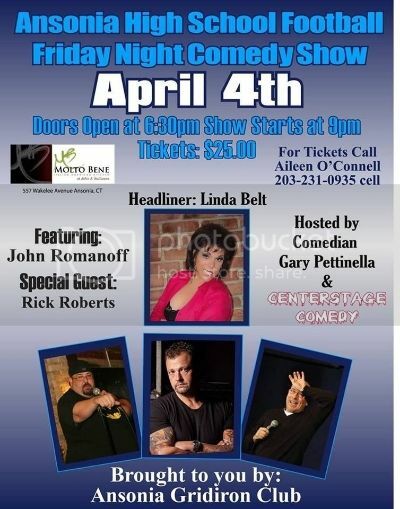 Upcoming Ansonia Football Comedy Show Fundraiser! 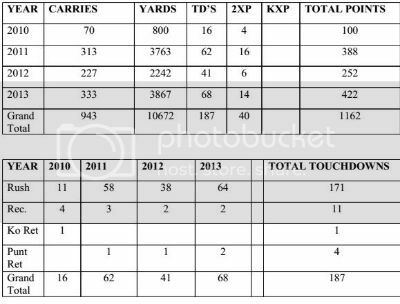 Snapshot of Newsome by season. Incredible. The Ansonia Chargers earned the states number 1 ranking in both the State Media & State Coaches polls! 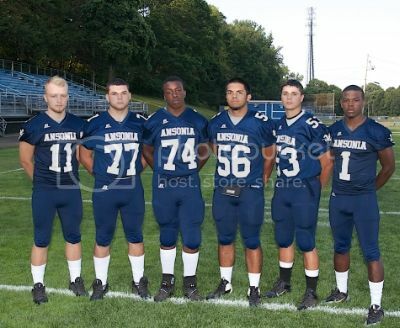 It's the 5th time Ansonia has finished the season ranked #1, and the first time since 2007! 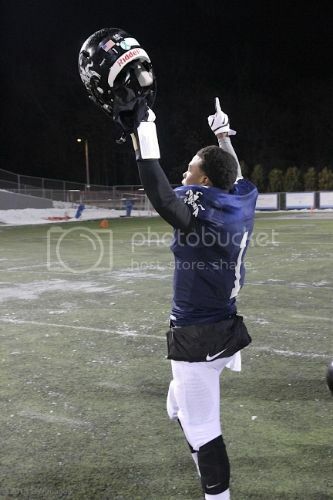 2013 Ansonia Chargers Number 1!" The Chargers completed the 3-peat, beating Woodland 51-12, and in the process winning their 43rd straight game! Head Coach Tom Brockett also earned his 100th victory. Arkeel Newsome carried 34 times for 259 yards and 4 TD's. He also threw an 11 yard TD pass to Tom Majchrzak. Newsome finished this season with 333 carries for 3,867 yards and 68 touchdowns. He has career totals of 10,672 yards and 187 touchdowns, both state records. Witold Gul returned a Hawk fumble for a score early on in the game, as the D forced 3 turnovers.